Groó did take liberties with some of the footage. Since no German archival film could be found of the impoverished Orthodox Jews who fled the pogroms of Eastern Europe for the Berlin slums – Jonas’s family among them – Groó used close-ups from archival footage of Orthodox Jews in Warsaw and Krakow. This movie moves – no talking heads, no deadly pans of documents. A vanished Berlin comes alive with the opening scene – the nearest thing to a 1900s music video of Berlin waking up. It’s a bouquet of black and white shots of Berliners starting their day to the song “Das ist Berlin!” with a tinkling piano sounding straight out of cabaret. Later we get a haunting tango. The first appearance of Jonas, from that single known photograph, now superimposed on a deserted street, imparts mystery. A woman’s voice, reaching back in time, speaks: “They say she walked on the street like a mystical medieval figure, her gaze turned inwards, her thoughts not on this world but on some completely different things.” The story begins. Regina Jonas (pronounced Re-GHEE-na YO-nas] emerges from this poetic documentary as a rare and unstoppable woman of faith. Amazingly, her father insisted on giving both his son and daughter a religious education. From an early age, Jonas told her classmates she wanted to be a rabbi. The film suggests that her decision went back to her father’s death, when the family was too poor to pay a rabbi to say kaddish. One extant letter asks her to tutor the writer’s son, followed by an apology pleading poverty. One wonders: Was the woman rabbi the one you went to when you couldn’t afford a real rabbi? Ironically, Hitler’s elimination of the Jews gave Jonas an official rabbinical position. A letter from a dwindling congregation thanks the Reich Association of German Jews–the compulsory organization established by the Nazis–for sending Rabbi Jonas to them. She was increasingly in demand as rabbis and congregants fled if they could, were deported to concentration camps if they couldn’t. She refused to leave. Interestingly, in the place where Reform Judaism was born, Jonas never thought of attempting a Reform Jewish route to the rabbinate–not that it would have helped. 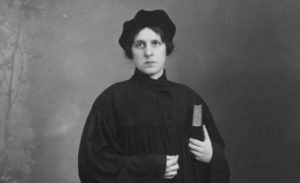 She studied; she taught; she visited hospitals; she looked after the impoverished elderly whose children had fled; she was the rabbi for all Jews who turned to her. And, near the end, there was love. Jonas found her soul mate in Joseph Norden, a Reform rabbi 32 years her senior. Judging by his letters to her, it was a mutually spiritual and passionate relationship. He was in Hamburg. She was in Berlin. They would travel to be together. His final letter before being deported to Theresienstadt concentration camp suggests that perhaps they will see each other there. That didn’t happen, although Jonas and her mother were sent to Theresienstadt in 1942. They died in Auschwitz two years later. Groó’s “Regina” is not a Holocaust tale but a gracefully edited documentary of a woman who emerges as determined, fearless, with the true calling of rabbi. –March 4 Library of Congress talk with Diana Groó and producer Alan Reich with “Regina” film clips at noon. –March 5 Washington Jewish Film Festival screening of “Regina” at 6:30 pm followed by talk with Diana Groó. –March 12 UMass Amherst Multicultural Film Festival screening of “Regina“ 7:30 p.m.